M. is not my only friend whose family tree connects him to Biblical figures. 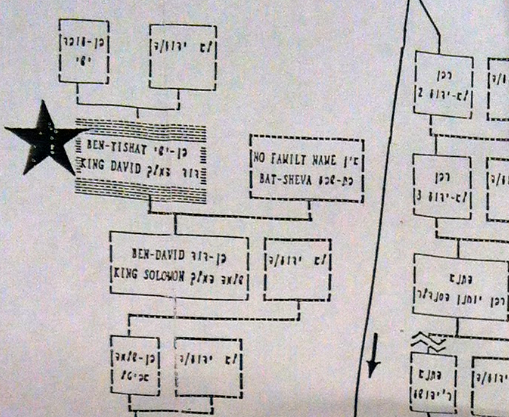 The earliest ancestor on Dan Smokler‘s family tree is King David! The earliest generations of Dan’s tree. King David is listed next to the star. How can these people make these claims? !, I wondered, when these friends told me about their remarkable trees. Thus was I introduced to a fascinating subset of Rabbinic genealogy focused on descent from King David. It turns out there are five so-called primary families who are traditionally considered to have descended from the Davidic royal family. Both M.’s and Dan’s families are descended from Rashi, an 11th c. French rabbi whose writings remain well-known today. Other such families include the descendants of Judah Lowe, the 15th c. Elder of Prague, whose great-great-grandson, Judah Lowe, the Maharal, is said to have created the Golem, and the Abravanel family, known best for descendant Isaac Abarbanel, who advised Ferdinand II and Isabella of Spain until he failed to stop their expulsion of the Jews in 1492. Compared to their counterparts in non-Jewish genealogy ranging from royalty to Mayflower descendants, these prominent, rabbinic families are a very rare example of published genealogies of Jewish families well-documented for centuries, comprising multiple sub-dynasties themselves. So, the work of family historians is to trace back not 500 or 1000 years to one of those primary families, but a much shorter distance to one of the derivative lines. In Dan’s case, a distant cousin in Israel reached out to his family to explain their connection to Rabbi Pinchas of Koretz (1728-1790), the famous Chassidic rabbi who is Dan’s eighth great-grandfather! It took two 10′ tables to unfold Dan’s entire tree! His family is in the bottom-left, Rabbi Pinchas of Koretz is bottom-center of the top sheet, and Rashi and King David are at the very top. Click to enlarge the image to make out the various family groups. Derivative to primary: The Spira/Shapira family traces back to Shmuel Shapira (b.1345), who descended from Rashi’s grandson, Isaac (1090-1130), better known as the Ribam, another famous rabbi whose works are still studied. Primary to Hillel: Isaac’s grandfather, Rashi (1040-1105), is traced 38 generations over 1100 years back to Rabbi Hillel the Great (110 BCE-10 CE), who lived in Jerusalem during the time of King Herod and Emperor Augustus and whose teachings are recorded in the Talmud and studied to this day. Hillel to David: Jewish tradition connects Hillel back 35 generations to King David’s son, Shephatiah. David to Adam: The Bible documents the 32 generations between King David (1043-973 BCE) and Adam. Done! The other primary families follow different routes back to David. The Abravanels, for example, are descended from the Davidic Babylonian exilarchs, the hereditary leaders of the exiled Jewish community founded in 586 BCE after the destruction of the First Temple. Their dynasty lasted until the time of Rashi. At this point you must be dying to know how we know all of this?! As you might expect, the sources become sparser as we go further back in time. We start with the genealogical sources most often cited today, published starting in the late 18th c., that trace derivative families back to primary families (#1 above). They are generally considered reliable, though there are sometimes gaps between generations. These more recent sources were based on earlier sources that only rarely survive. In the case of Rashi, there was a genealogical record going back to Hillel’s great x 3 grandson (covering the period of #2 above) which was destroyed in the Swabian War of 1499. “Johanan Luria mourned the loss of his genealogy more than the material goods he was robbed of,” wrote Abraham Epstein in his early 20th c. work, Mishpachat Luria. What genealogist would not weep with him? To get from Hillel to David (#3 above), the source here is more modern than you might expect, a 10th. century work by a prominent Babylonian gaon (leader), based on a work purportedly from 68 CE, just after the Second Temple was destroyed. The Talmud also reports that Hillel descended from Shephatiah. But in the case of the Abravanels, who descended from the exilarchs, there is a chronicle from the 9th c., which extends a 2nd c. source to trace the exilarchs back to Adam through the first exilarch, Jeconiah, who is mentioned not only in the Hebrew Bible, but also in cuneiform tablets excavated in Iraq! Certainly we are now well beyond the territory of trustworthy historical sources. And even the more recent sources can’t entirely meet a genealogical standard of proof. Personally, I view these sources in the context of the unbroken line of religious teachings passed down faithfully by people like the authors of these works, who believed they had a holy obligation to do so. 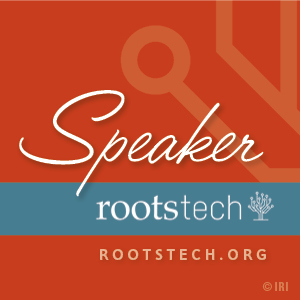 In both genealogy and religious instruction — and there’s an overlap between the two that starts with Genesis and continues through many traditional Jewish sources — oral tradition only belatedly became written texts, and while a tension between preserving truth and embellishing may have come into play, I suspect truth won far more often given the mindset of the authors, steeped in a tradition-obsessed culture, who dedicated their lives to its preservation. Does any of this matter if we can’t be sure? There is proof, the work of genealogists, and then there is meaning, a goal of more casual family historians. 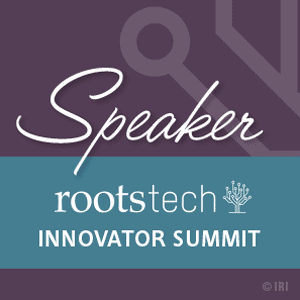 Learning his family tree did not make Dan a genealogist, but he was so moved by the knowledge that he named his first-born after Rabbi Pinchas of Koretz in the hope that he would emulate his pious ancestor’s virtues. At the close of the circumcision ceremony, Dan inscribed his son’s name on the family tree in front of all the gathered friends and family, the second of what I’m sure will be many ways in which he will raise his son with an awareness of his illustrious lineage and the example set by his ancestors. Whether the entirety of their enormous tree meets a genealogical standard of proof is irrelevant if it helps to raise a boy to be kind and good. This entry was posted in Personal Stories by Tammy Hepps. Bookmark the permalink. Great post! 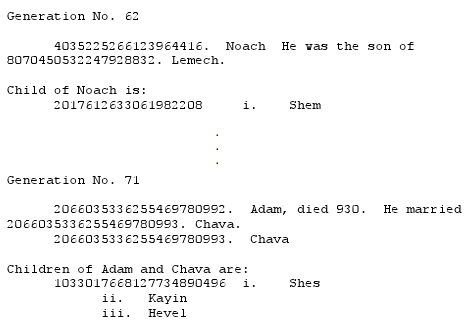 For what it’s worth, don’t feel jealous: you may not have the details, but I think you can be relatively certain your family goes back to Adam and Chava, too! Now I’ve heard everything! How fascinating! Thanks for sharing this fun fact. Hahaha, Schelley! BTW, I mean one day to do an update on this post incorporating the information you shared with my about some of the Syrian lineages. I am a descendant of R. Nathan Neta Spira too! Is there any way that I’d be able to contact Dan to get a copy of that huge family tree??? It would be fascinating to see my family’s genealogy so clear like that! I think perhaps that you and I may be related Esther, because I am descended from the Spira lineage of Krakow, Poland which is probably descended from Nathan Neta Spira. My father was born in Krakow in 1908.
probable is not genealogical proof. Please Folks,Does anyone here have any info or connection with the line into which the French Count of Toulouse married in the middle ages? The Jewish spouse descended from the Babylonian Exhilach. Hi Ken, this isn’t something I know much about, but perhaps try posting this question in the “Tracing the Tribe” group on Facebook? Good luck. 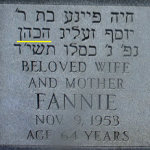 I have been recently researching my own family lineage with my aunt, who discovered that we connect to the Shor line, from Joseph ben Isaac Bechor-Shor. I was wondering whether you knew anything about his lineage? Cool post. How many generations have there been from now to Adam? this is all so interesting.. do you have any information on Golub…my fathers last name and he is gone never giving much information in his life time. Our older generations all deceased. Any information of the Golub name would be appreciated. How about writing your question in English, rather than gobbledy-gook? Punctuation and spelling might be helpful.